I get Seasonal Affective Disorder every year. It usually sets in around November, but I’ve made it to December without much struggle before. It’s right on time this year. The switch from Daylight Savings hasn’t helped either. Now, when I get home from work, it’s already dark. I don’t feel any motivation to forage because it’s dark after work. I don’t feel any motivation to forage because it’s the wet, rainy season. I don’t feel any motivation to do much of anything at all except sleep and maybe watch Venture Brothers because of the SAD. There doesn’t seem to be a whole lot to forage right now, anyway. And it’s going to be like this all winter. Perhaps I just haven’t acquainted myself with cold-weather foods. Hunter-gathering people preserve food for the winter months. I haven’t been doing that because I can just go to the store if I want to. I’m feeling stubborn, so I’m refusing to buy food until I go through what’s in my cabinet. I tend to forget about things like dried beans and cartons of soup and pass them over for more exciting and novel things when I shop regularly. I’m reinforcing whatever is in my cabinet with whatever I forage. So not much fresh food. On a blustery, rainy hike in the Gorge last weekend, I was hoping to find mushrooms. All I found were honey mushrooms, and pretty old ones at that. I’ve never tried honey mushrooms before because, until this point, there have been more exciting mushrooms, such as boletes or chanterelles. Now there are just honey mushrooms, and they’re everywhere. Today, I brought home some that I found near PSU in a small paper bag. I had seen them fruiting for weeks. They were certainly fresher last month, but back then I had chanterelles, and now I’m getting desperate for things to forage. The foraging master Wildman Steve Brill says that honey mushrooms are one of his favorite fall fungi, but I had heard they were considered mediocre. 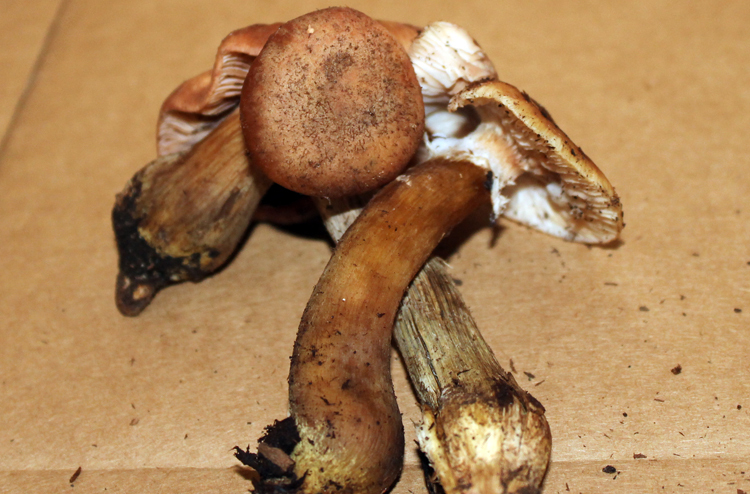 I used All the Rain Promises and More by David Arora to identify the honey mushrooms (Armillaria mellea). For me the main unique characteristics are white spores (You can often see the spores that have fallen from taller mushrooms dusted on the caps of shorter mushrooms. 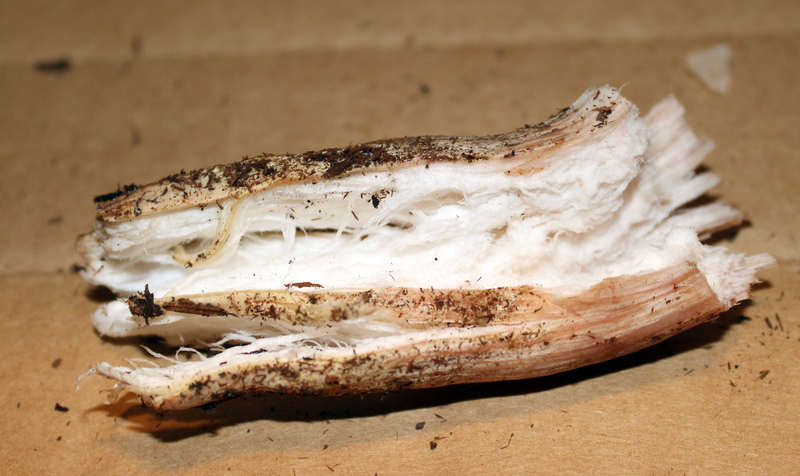 ), white to tan gills, and a white pith inside of the stipe that is fibrous like string cheese. Unless they’re the ringless honey mushroom, most honey mushrooms have a ring high up on the stipe. They’re usually found growing in clumps at the base of stumps, but sometimes the dead wood nourishing them is below ground. Honey mushrooms are supposed to be difficult for newbies to identify (although I’m not sure why), so don’t go trying to find them based on my non-expert description. They would have been much better when they were younger and before someone had stomped most of them down. 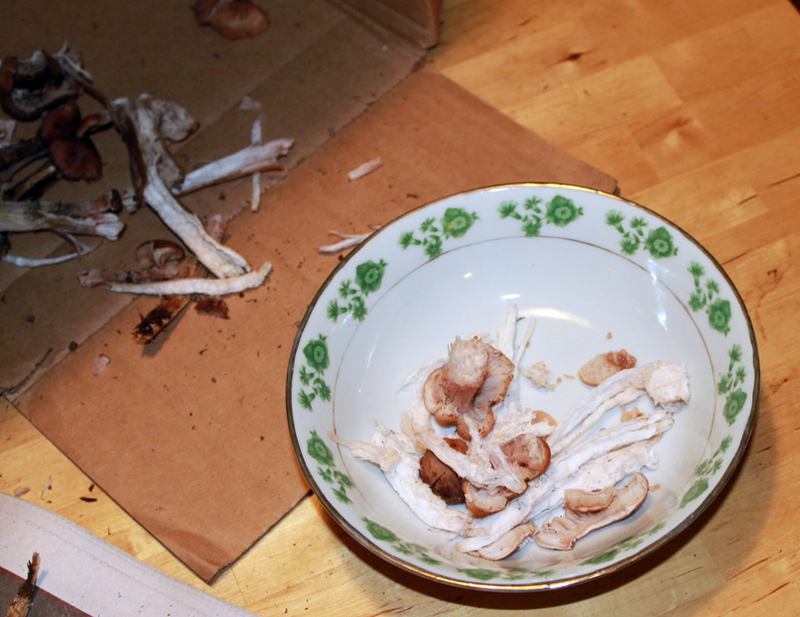 Some of the mushrooms I brought home were rotting, either covered with mold or turning brown in the stem. You can see from the photo how little biomass was left after I rejected all the icky parts. Since the insides looked like string cheese, I had the idea that I would bread and fry them. That was earlier in the day, before the sun went down and I started feeling mopey. Putting mushrooms in a pasta sauce is easy and fairly fail-safe. I separated the caps from the stipes. Some sources say that the stalks are inedible, but Arora recommends taking off the outside and frying up the stringy pith. Since Brill recommended cooking the mushrooms for at least 15 minutes (or they may give you the collywobbles), I set a timer, threw in some butter, threw in the mushrooms, and started chopping the garlic. (Garlic should be allowed to sit after chopping to unlock its full health potential. Something I learned from Eating on the Wild Side.) Then I chopped onions and added them. I was rewarded with the reassuring umami scent of onions and mushrooms frying together. I was doing something right. And finished it all up with discontinued Ben & Jerry’s ice cream for dessert. Gotta clear out all the old food. Gorgeous photos! Yummy recipe, too.